by Audrey Wood, illustrated by Don Wood. No, really: it was a dark and stormy night as we read together, and that helped set the stage for our discussion on the importance of using light in creating the mood for a story. In the book, everyone in the house is sleeping in a darkened room, in bed. The grandmother starts out alone, and is joined by her sleeping grandson, the sleeping dog, cat, mouse…until a flea bites the mouse and sets off a chain reaction that wakes everyone up. Once everyone is awake, light pours in through the window, and the book closes with everyone outside playing in the sunshine. This book led to a discussion on the use of light and darkness in storytelling. We discussed words that come to mind when we see a dark scene versus when we see a light scene. We discussed how looking at dark pictures or light pictures makes us feel a certain way, or reminds us of experiences we have had, or sounds that we have heard. 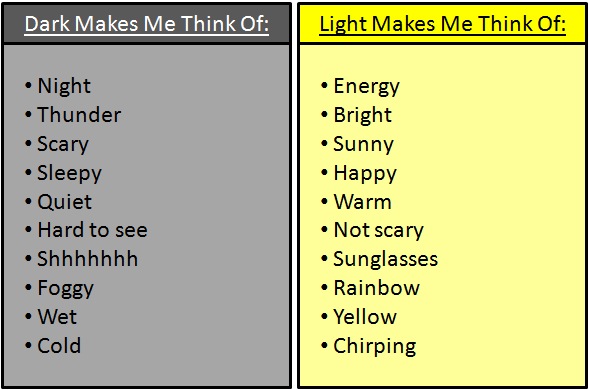 I asked my 4 year old to think about what he thinks about when he hears the word “dark” and the word “light.” Using his five senses, what does he picture when he hears these words. What sounds, images, feelings do these words evoke? For this exercise, we focused on three senses – touch, sound, and sight. 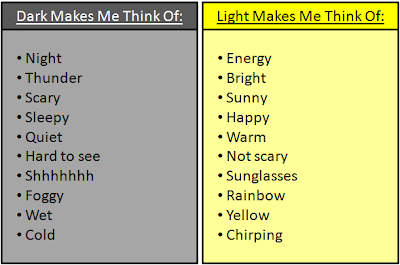 I pointed out that if he thinks of these words when he hears “light” or “dark,” other people probably feel the same way. So we got out some of his pictures, and talked about if they used dark or light colors. When he makes a picture light or dark, people looking at his picture will be reminded of their experiences with their own senses. In his stories, when he is deciding how he wants to set the scene, one of the things to consider is the use of light. I asked him if he wanted to tell a scary story, would he want the picture to be light or dark, to which he responded dark, with thunder. I asked him what about if the story was about winning a soccer game, and he said light. We went through a few examples, which was a fun way to reinforce this concept. As we read, I sometimes ask my son to tell me what he thinks is going to happen before we’ve read the page. This gets him looking at the pictures, and thinking about what is going on in the story, and what may come next. As we discussed light scenes as compared with dark scenes, I explained that he was already using the clues provided by whether the scene was light or dark. When he looks at a picture of everyone sleeping in a dark room, it makes him think of “quiet” and “nap” and “rest.” This helped him to understand that he already was using the concepts we were discussing, without even realizing it. Now, in his storytelling, it is one more tool he can use intentionally. Disclosure: An Amazon affiliate link is used in this post.